Do you have Spanish speaking customers? 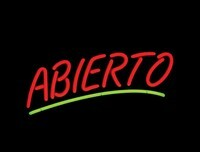 If so, this Abierto open neon sign is a must. You may be missing out on valuable customers without it! Solid state transformer backed by full 1-year warranty. Sign is a 100% hand crafted, with quality 1/2" diameter neon glass tube. Ready for action, hanging hardware and chain included! Plugs into standard 110-volt outlet. Indoor use only.